This weekend was that time of the year, when the man of the house spent more time in the loo – than with us. Our baby was travelling solo – to spend her hols with grandparents. It didn’t matter if this was her second solo trip. Her travel experience in no way seems to settle his nerves. Well…Here’s an excerpt of dialogues and events that ran up to this morning. “I need to check if I will get leave,” I explained. “I’ve already blocked my days,” chipped in the dad. “But we never discussed any such holiday,” I wondered aloud. “See, so you came for your detox…” I didn’t give a clarification. 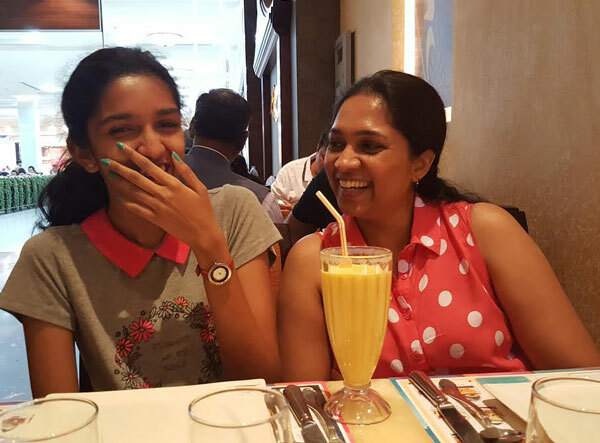 Mango lassi time… We are the best of buddies! Saturday morning. Luggage packed, I sat to check her bag if she has stuffed in any impermissible items, what with her penchant for trivia, all the while reminding her of the key, passport, ticket copy, when I discovered her favourite bars of Galaxy chocolates and a new USB. Sunday early morning. At last, it was time for check-in. As we waited to be attended to at the ‘Minors unaccompanied’ cabin at the airport, I noticed her glum. O! my baby, she’s feeling the jitters! This morning, in office I waited with bated breath to hear my dad say she’s landed fine. “Hey! My baby. How was the flight? All okay…” I gushed. READ: First solo travel note… Am I a good mom? So the dad trumped you! Hunph!! Of course Galaxy Bars and the that UBS are more important that passports :-). They do know how to get onto the good side of the kids. Yeah Tulika, dad's are excellent at that!